As a bonus for our Photography Contest, -CLICK- has also released two new props. We first introduce you to The Bar. 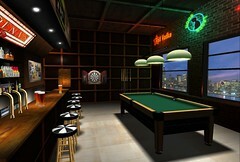 It is just your normal bar and slice of real life. 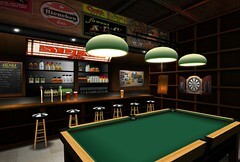 This prop scene is inspired by an English pub setting and that home town bar feel. It comes complete with 27 single and 9 couple poses (first time we use couple poses) by LAP. It also comes complete with a bonus prop box which includes: Liquor bottles, Wine glasses, Cue sticks, Darts, Billiard Balls (in a few different set ups) Color changing pool table, beer bottles, Waitress Tray, and Beer Glasses filled with Beer. Everything you need to set up for a true authentic bar. Sports season is among us, especially with the World Cup and the soon to be new SLNFL leagues. 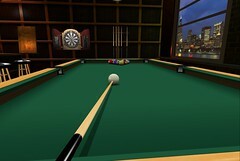 In the spirit of sports, -CLICK- introduces the Locker Room. 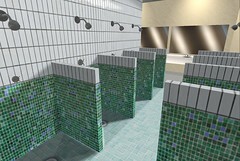 The scene works for several occasions such as a high school locker room, sports locker room, or workout type locker room due to the several multiple locker changing textures provided. Don't forget to hit the showers! The prop scene comes with 20 single poses and 5 couple poses by Exposeur. 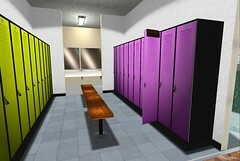 The Lockers comes with Texture changing lockers 12 to choose from (even the infamous Flix Pink set!!! ), Soccer balls, footballs, Working Particle showers, Homecoming banner, Locker filling items (backpack towels,locks) and more. It is truly a must see.